UF/IFAS Assistant Professor Brian Pearson [right] says Florida’s burgeoning craft beer industry makes hops an attractive alternative cash crop for local growers seeking to diversify their farm portfolio. Can hops grow in Florida? That question has been answered in the affirmative over the last couple of years with experimentation and determination. Now, the question becomes can local scientists brew up new varieties of hops specifically suited for Florida’s unique growing environment? Well, they’re working on it and are ready to pour it on thanks to fuel from a two-year, $194,000 government grant. The latest round of grant money will help continue collaborative work of researchers across the state who are cultivating varieties of hops to see which ones will grow best locally. Ironically, one of the biggest challenges facing hop production in the Sunshine State is shorter day length. Florida comes up a bit short in the amount of daylight compared to its traditional hop-producing competitors in the Pacific Northwest. One possible solution would be to breed a new variety that doesn’t need as much sunlight. Meanwhile, there have been light treatment studies conducted that have exposed potential for significant growth and yield increase. Interest in Florida-bred hops extends well beyond the state’s borders. Scientists from Brazil, which has a climate similar to Florida’s, are curious about the possibilities, too. 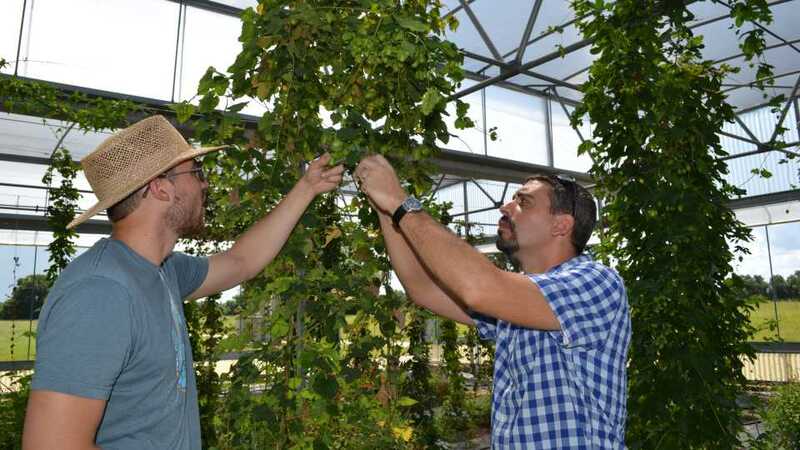 “Our breeding a new variety would be huge, not just for Florida, but also for other countries that pay an exorbitant amount of money to import hops,” stated Brian Pearson, Assistant Professor of Environmental Horticulture, who is based at the UF/IFAS Mid-Florida Research and Education Center in Apopka. While the prospect of Florida-friendly hops is fresh right now, it could be a while before the effort bubbles to fruition. Researchers point out that it can take five to seven years to produce a new variety.